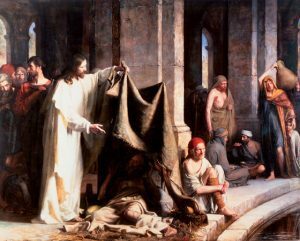 The BYU Museum of Art recently acquired this Carl Bloch painting, Christ Healing the Sick at Bethesda (1883), which defined the Bethesda Indre Mission in Copenhagen, Denmark for nearly 120 years. MARY Lois Wheatley’s fragile hands worked to untie the blue and white bow uniting a pair of tall dark curtains inside the BYU Museum of Art. A few dozen museum guests watched, patiently and silently, as she persisted in the plainly difficult task. As she grasped the ribbons and gingerly pulled them apart, her husband, Jack, and Campbell Gray, the museum’s director, drew the curtains to the sides. For a moment Mary Lois stood alone before a Carl Heinrich Bloch masterpiece, a painting depicting sickness and suffering, healing and hope. Christ Healing the Sick at Bethesda (1883), a new acquisition by the Museum of Art, came to Provo after more than a year of negotiations with the owner, the Bethesda Indre Mission in Copenhagen, Denmark. For nearly 120 years the work defined the mission, the building for which it was commissioned. But on the afternoon of Nov. 2, 2001, the long-admired painting made its U.S. debut, thanks to the Wheatleys, who donated the funds to enable the museum to purchase the work. Carl Bloch (1834–1890) considered his religious paintings the most significant accomplishments of his career. Christ Healing the Sick at Bethesda (1883) is one of eight altarpieces created by Bloch for churches in Denmark and Sweden. In recent years the administrators of the Bethesda Indre Mission had an increased need for money to restore and maintain the structure, thus creating an opportunity for BYU to acquire the painting. With scriptures in hand, an emotional BYU president Merrill J. Bateman pointed out various figures in the work. A man behind the Savior crouches with his hands in sandals. His head is turned toward Jesus as if waiting his turn. info: Christ Healing the Sick at Bethesda, along with 11 Bloch etchings, is on display in the Museum of Art.